It uses MU-MIMO technology and a dual-core processor to keep data flowing smoothly to several devices simultaneously. 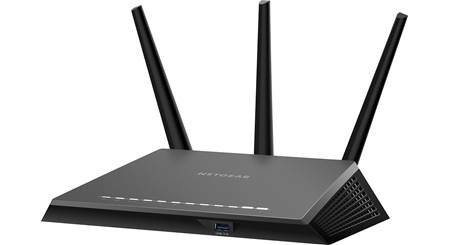 The Linksys EA7500 router offers powerful, consistent Wi-Fi coverage for a medium-sized home, so your family can stream movies, play online games, and browse the internet glitch-free. It uses advanced MU-MIMO (multi-user, multiple-input, multiple-output) technology and a dual-core processor to keep data flowing smoothly to several connected wireless devices simultaneously. You'll have up to 1900 Mbps of fast, dual-band Wi-Fi for work and play. Use beamforming to "aim" stronger Wi-Fi where it's needed most. The Linksys EA7500 offers super-fast wireless coverage and wired connections. It's easy to forget about the advantages of making direct connections to your router. 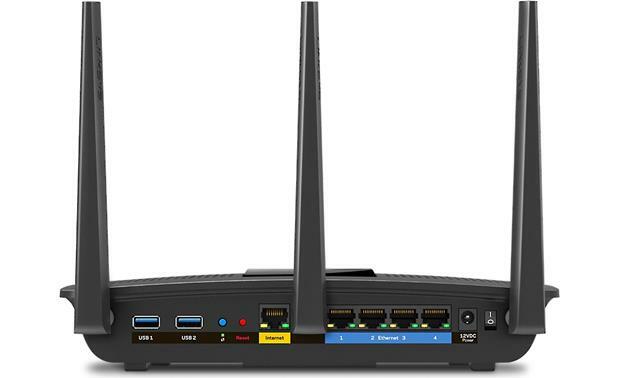 The EA7500 provides LAN ports so you can directly connect devices like desktop computers or home automation control hubs, taking some strain off of your wireless coverage, and ensuring top speed through the wired connection. There are two USB ports — one 2.0, one super-fast 3.0 — on the back, so you can share from a thumb drive and connect to a wireless printer at the same time. 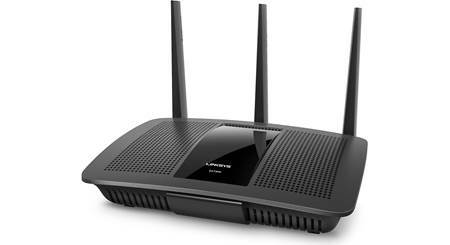 The Linksys EA7500 is easy to set up when you use the website. With the new modem we purchased recently, internet download speeds have now more than doubled! Downloads are faster too and coverage at the other end of the house has improved. Great product. Max-Stream AC1900 WiFi Router: The Linksys EA7500 Max-Stream AC1900 MU-MIMO Gigabit WiFi Router is a Dual-Band Smart WiFi Router with dual USB ports (2.0/3.0) and four Gigabit Ethernet LAN ports. It supports data rates of up to 600Mbps for the 2.4GHz band and up to 1300Mbps for the 5GHz band. This router comes with three external detachable dual-band dipole antennas for enhanced dual-band communication, better coverage and range. 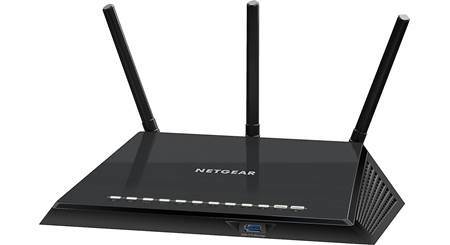 It lets you stream in 4K, surf, video chat, and play online without buffering at the same time. 1.4GHz Dual-Core Processor: Powered by a 1.4GHz dual-core processor, the Max-Stream AC1900 WiFi Router is capable of handling three simultaneous data streams. This results in improved WiFi performance and faster WiFi speeds to more devices. 3 External Antennas: The Linksys EA7500 has 3 external dual-band dipole antennas that are adjustable and detachable. Optimized for coverage in medium homes, these three high-performance antennas broadcast a strong WiFi signal that improves connectivity in hard-to-reach areas. Play video games, listen to music, check emails, shop online, stream HD movies, and more, without having to worry about dropped signals. 3x3 Wireless-AC: 3x3 Wireless-AC delivers 3 streams of data simultaneously. AC WiFi delivers exceptional speed and performance, and is 3x faster than Wireless-N. 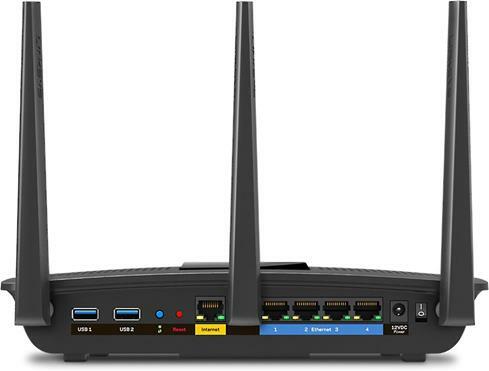 The Linksys EA7500 router supports the following WiFi standards - 802.11a, 802.11b, 802.11g, 802.11n, and 802.11ac. AC WiFi delivers exceptional speed and performance, and is 3x faster than Wireless-N.
Dual-Band (2.4GHz + 5GHz): The Linksys Max-Stream AC1900 WiFi Router offers two dedicated WiFi bands that deliver combined speeds of up to 1.9 Gbps. Moreover, it can connect up to 10+ devices. High-bandwidth activities like 4K video streaming are connected to the high-speed 5 GHz band, while basic activities like email are placed on the 2.4 GHz band. Advanced WiFi Technologies: The Linksys Max-Stream AC1900 WiFi Router incorporates advanced WiFi technologies like MU-MIMO, Beamforming, and Seamless Roaming. MU-MIMO (Multi-User, Multiple-Input, Multiple-Output): The Linksys Max-Stream AC1900 WiFi Router features Next-Gen AC WiFi with MU-MIMO technology, the latest advancement towards uninterrupted, simultaneous WiFi connections. Devices such as 4K TVs, HD streaming media players, tablets, game consoles, and many more use a lot of bandwidth, and with MU-MIMO (Multi-User, Multiple-Input, Multiple-Output) technology, the Max-Stream AC1900 WiFi router sends WiFi to multiple devices at the same time and same speed. Your whole family can play, stream, and work at once, without experiencing lag or buffering--at up to 2x the speed of a non-MU-MIMO router. Beamforming: The Linksys EA7500 has Beamforming technology on both bands which helps improve the quality of voice, streaming of video and other bandwidth and latency sensitive transmissions. Direct WiFi signals to each of your mobile devices to increase signal strength and coverage. Play video games, listen to music, check emails, shop online, stream HD movies, and more, without having to worry about dropped signals. Seamless Roaming (requires optional Linksys Range Extender): To enable Seamless Roaming, pair this Max-Stream Router with a Max-Stream Range Extender (such as the Linksys RE7000, sold separately). The intuitive technology lets you move freely in and outside of your home without dropping a WiFi signal. Note: Certified Operating Systems include Mac OSX (10.x or higher) and Windows 7/8.1/10. Supported Internet browsers include - Latest versions of Google Chrome, Firefox 8, Safari 5 (for Mac and iPad), Microsoft Edge, and Internet Explorer version 8 or newer. Guest Network: There are two Guest networks that can be set up on the Linksys EA7500; one for each network band (2.4 GHz and 5 GHz). The default SSID of each Guest network is the SSID of the main network appended with the -guest suffix. Create a separate, password-protected WiFi network for up to 50 guests and easily share the password. Guests will be removed in First-In, First-Out (FIFO) order once the maximum number of guests is reached. Gigabit Ethernet Ports: The Linksys EA7500 router is fitted with five 10/100/1000 (1 WAN & 4 LAN) Gigabit Ethernet ports with auto-sensing technology. The WAN port is used to connect your Internet modem, while the LAN ports are used to connect your local network devices. Dual USB Ports: The Linksys EA7500 is equipped with dual USB (type-A) ports; one USB 3.0 and one USB 2.0. Share audio, video, photo, and document files; add external storage across your network; or connect to a printer or scanner with these USB ports. Either USB ports support FAT, FAT32, NTFS, and HFS+ journaled and non-journaled file format systems. USB 3.0: The USB 3.0 port is capable of supporting an external hard disk or flash drive with up to 1100mA current draw. USB 3.0 offers enhanced speeds over 2.0. USB 2.0: The USB 2.0 port can be used to connect a printer or scanner on your network. 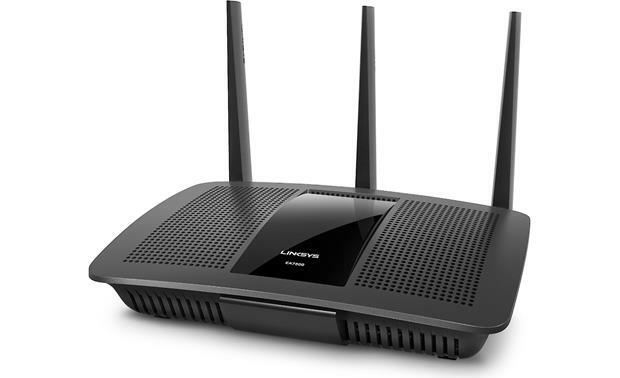 DLNA & UPnP Compliant: The Linksys EA7500 router supports DLNA & UPnP for connectivity and streaming between compatible network devices. The Universal Plug and Play (UPnP) and Digital Living Network Alliance (DLNA) both have a set of guidelines that allow interconnectivity between network devices. Advanced Security Modes: The Linksys EA7500 supports WEP, WPA2 Personal, WPA2 Enterprise, WPA2/WPA Mixed Personal, and WPA2/WPA Enterprise on both 2.4GHz and 5GHz bands. Its provides up to 128-bit encryption. You can even use WPS (WiFi Protected Setup) technology to automatically and securely add wireless devices to your network. Wireless Scheduler: The Wireless Scheduler feature of the Linksys EA7500 allows you to turn Off or On the wireless networks, including the Guest networks at your preferred time. AC Power: The Linksys EA7500 router includes an AC power adapter which will need to be plugged into an AC wall outlet. Input (100-240V ~ 50-60Hz); Output (12V, 3.5A). Mounting Options: The Linksys EA7500 router can be place horizontally on a table-top or mounted vertically on a wall (mounting screws not included). I lost the sticker with the default password information on it and have no way to log into my linksy ea7500 router? 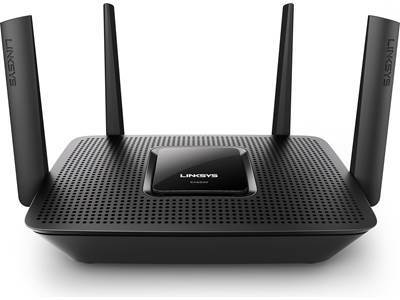 Searches related to the Linksys EA7500 MAX-STREAM™ AC1900 dual-band Wi-Fi® router.